In the aftermath of Julius Caesar's assassination, Mark Antony was shocked to find that he was not named Caesar's heir. Instead, it is Caesar's 18 year old great-nephew Octavian who inherits everything. After they deal with Caesar's assassins, Octavian, Antony and another Roman, Marcus Lepidus, split the governing of the territories of Rome amongst themselves. Lepidus is charged with Africa. Mark Antony lets Octavian take Rome itself, along with Eastern territories, hoping that the lack of grain facing the city of Rome will have the people rebelling against Octavian soon enough. For himself, Antony takes the rich territories of the west. Only Anthony doesn't find the riches he was expecting in the West. Nor are the battles so easily won. And instead of faltering with Rome, Octavian is fast making a name for himself with the people. Soon enough, Rome may only be big enough for one of them. I have read every book in this series (a long time ago, before I started writing reviews) and there are two things that I have always disliked about these books. The first is how awkward all of the historical events are crammed into the stories. Of course there are battles and events that have to be relayed and I appreciate that the author is going for historical accuracy, but I think there are easier ways to tell a story. Sometimes you just get an onslaught of names that then don't show up again. The second is how she deals with gay characters. All her gay characters are pretty much just negative stereotypes. I really don't know why I read this series, except that I like history and, in particular, this period of history and really want to read everything I can. I freely admit that I have my own biases when it comes to history. I watched a program once - though I can't remember much else about it - that concluded that while Cleopatra and Caesar was a politically motivated match, that Antony and Cleopatra was a love match. So I was disappointed that it was the other way around in this series. 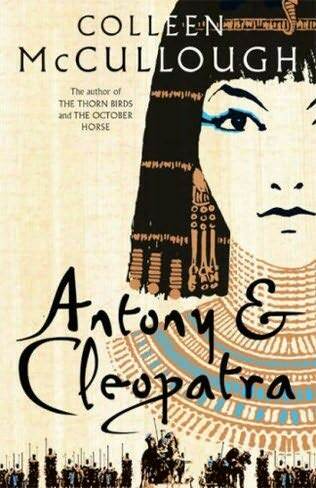 I hated the characterization of both Antony and Cleopatra, who were so much more incompetent than I picture them being from other things I have read. It was also annoying to see Antony’s name spelled one way on the cover (which was how it was spelt throughout the story) and a second way in the author’s dedications at the beginning of the book. I think reading too much of this series over time has numbed me against really getting angry at things, so that the book was just kind of dull. It never really had any interesting or standout section.